Do you know where the idea for the AddWash washing machine came from? You might be surprised to learn the product was originally developed specifically for consumers in Southeast Asia. When analyzing Southeast Asian consumer needs regarding washing machines, Samsung Electronics learned that many individuals wanted a way to add an item after starting a cycle. Developed with consumer feedback and lifestyle habits in mind, AddWash was equipped with a small window on the main door that allows users to easily add a piece of forgotten laundry to the wash mid-cycle. As a result, AddWash became a highly popular customized product. So much so that it even landed the ‘Design of the Year Award’ at the President’s Design Award in Singapore and also won the ‘Ergonomic Design Award’ at the Asian Conference on Ergonomics and Design. This shows how much Samsung is being loved among consumers as one of the most preferred home appliance brand in Southeast Asia. Twin Cooling SystemTM: Samsung’s innovative Twin Cooling SystemTM technology was created based on the needs of consumers in select Southeast Asian countries, where many cuisines are defined by strong spices and pungent flavors. In Vietnam specifically, many citizens enjoy putting ice in their beer. But because the cooling systems of conventional refrigerators often caused a mixing of odors, ice frequently tasted of other refrigerated items such as seafood. With Samsung’s Twin Cooling SystemTM, which controls the refrigerator and freezer independently, food odors are isolated, ensuring that ice tastes like ice and not like fish. It also expanded freezer space to reflect the needs of users in Vietnam and India, thus improving customer satisfaction and increasing sales. Wind-Free™ Air Conditioner: Samsung’s first ever Wind-Free™ wall-mounted air conditioner, which integrates Samsung’s exclusive Wind-Free™ Cooling technology into its design, enables a cooler indoor climate and energy efficiency without the discomfort of direct cold airflow. This innovative product was designed for consumers in Southeast Asia, where air conditioners are used throughout the entire year. Microwave Oven: Similarly, Samsung created a microwave equipped with a unique local recipe function, specialized for the Malaysian market. Efforts like these have enabled Samsung to secure its position as one of the most dominant brands in Southeast Asia. Furthermore, the company’s localized products have not only been well received in the markets in which they were optimized for, but have also attracted global attention. 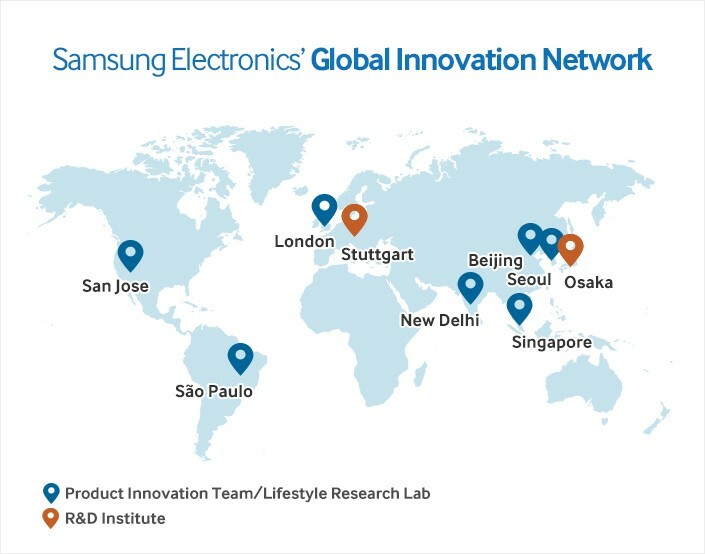 To determine specific regional needs to develop such products, Samsung has a total of seven Product Innovation Teams and two R&D Institutes across ten countries. At these facilities, the company’s Product Innovation Teams continuously conduct extensive research to understand how different people approach and use technology today. The Lifestyle Research Lab, which is one of core functions of the Product Innovation Team, looks beyond product behavior to discover evolving needs and values surrounding the family, work and education, as well as other societal and cultural trends. Keeping the environment, culture and consumer lifestyles of each region in mind, the teams forecast future ways of living and define opportunities for innovation. The Product Innovation Teams then use these findings when creating prototypes to unearth insights and develop concepts for game-changing products and solutions. AddWash, for example, was developed entirely at the Lifestyle Research Lab in Singapore, from the initial concept planning stages all the way to the product development stages. Ultimately, the teams’ research findings help to accommodate the ever-changing needs of users in various corners of the world. In line with its commitment to deliver meaningful innovations that add real value to consumers’ everyday lives, Samsung will continue to develop products and solutions optimized for the needs of each region around the world.